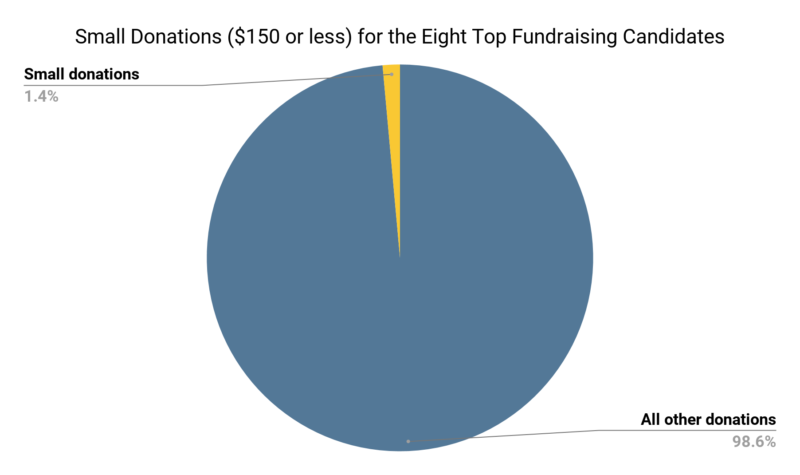 An analysis of contributions in the 2019 Chicago mayoral race shows that small donors – those who give $150 or less* to their favored candidate – make up a minuscule percentage of most candidates’ fundraising rosters. The numbers highlight the need for campaign finance reform such as a small donor matching program, which magnifies small donations and encourages candidates to seek support from everyday citizens instead of wealthy individuals and special interests. We looked at the top eight fundraising mayoral candidates from the inception of their campaign committees until December 31, 2018, the last date for which small donor data is currently available. By the end of 2018, a total of $12.2 million had been raised by those eight candidates. We found that donations of $150 or less added up to just $175,682.36, or 1.4%, of the total. As the son and brother of previous Chicago mayors, former Obama Chief of Staff, and Commerce Secretary in the Clinton administration, Bill Daley has tapped into his expansive and well-heeled political donor and business networks to fill his campaign coffers. He’s been a particular favorite of private equity executives, who have contributed hundreds of thousands in large donations to his account. By contrast, donors contributing $150 or less made up a meager 0.1% of Daley’s overall haul as of the end of last quarter. Illinois comptroller Susana Mendoza’s small donors have contributed about double the amount of Daley’s, but were still virtually nonexistent at 0.2% of her fundraising by the end of 2018. Similarly, just 0.6% of Cook County Board president Toni Preckwinkle’s total included contributions of $150 or less. Most other candidates didn’t do much better: Gery Chico and self-funder Willie Wilson came in tied at 1%, Paul Vallas’s small donor percentage was 1.7%, and Garry McCarthy’s was 3.5%. Only former Chicago Police Board president Lori Lightfoot, who has touted her broad fundraising base, garnered anything approaching a meaningful slice of funding from smaller donors by the end of the year, reaching almost 8%. While this is significantly more than her competitors, it is still dwarfed by her larger contributions. While all the candidates have relied on big donors, Daley stands out. 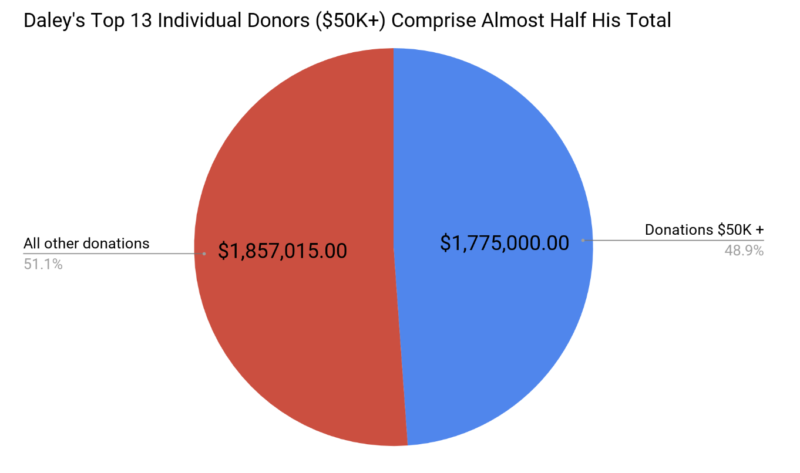 As of the end of 2018, thirteen of his individual donors had given $50,000 or more, totaling 48.9% – nearly half – of his fundraising total. Notably, Daley’s biggest donor is himself – he started his mayoral run by dropping $500,000 in of his own money into his campaign account. Only Willie Wilson gave himself more last year (just under $1 million). The numbers are clear – everyday citizens have had virtually no financial impact on the Chicago mayoral race. Instead, candidates have been relying on a handful of wealthy individuals for a huge proportion of their funding. Reform is needed. It may be time to revisit Illinois’ “self-funding” provision that lifts all contribution limits when one candidate gives himself more than $100,000, as Willie Wilson did early in the race. Lifting the caps was meant to level the playing field for non-wealthy candidates, but in the current system it opens the floodgates to big money and further incentivizes candidates to focus on megadonors. More importantly, we need reforms that amplify the voices of everyday citizens and ensure that elected officials feel accountable to the broader public, not just to a narrow elite with deep pockets. Reform for Illinois supports public financing programs like New York City’s successful small donor matching system, which turns small donations into big ones and has been shown to increase donor and candidate participation across all walks of life. Jurisdictions around the country are adopting such programs to help make their governments more ethical, equitable, and accountable to the people they serve. Illinois should pay attention. *We use $150 as the small donation threshold in part because it approximates a widely accepted standard and in part because Illinois law requires only donations over $150 to be itemized on campaign finance reports. We recognize that $150 is not, in fact, a very small donation. $150 is a significant amount of money for many, if not most, people. That donations at or below that level comprise such a small portion of fundraising shows just how excluded from the process people of average or modest means are. 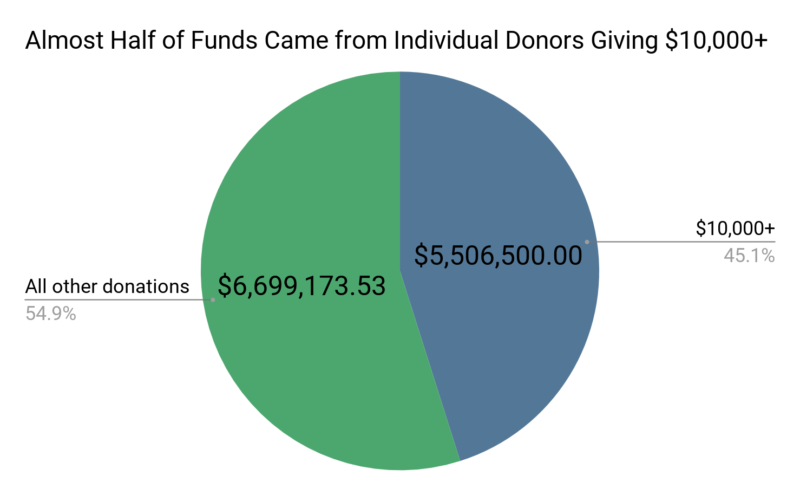 **This analysis may actually underplay the impact of big individual donors, since some such individuals may contribute via LLCs, trusts, or other entities that we excluded from our top donor count.